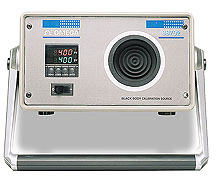 The BB702 Blackbody Calibrator is a high performance, rugged, portable calibrator for infrared pyrometers. The BB702 has a range from Ambient +10 to 215°C (Ambient +20 to 420°F) with an accuracy of ±0.5°C, ±0.25% rdg. The unit provides a heated target plate of known temperature and emissivity. Virtually any infrared pyrometer with a spot size diameter of 63.5 mm (2.5") or smaller can be calibrated. Both models come with an RS-232 computer interface which allows computer control of the setpoints for automatic test applications. An NIST traceable calibration certificate is also provided. 참고: Comes complete with operator’s manual and NIST calibration certificate.